If you've got a little driver on your hands the awesome Jumbo Race Car Carrier from Melissa & Doug is sure to be a massive hit. An oversize wooden Car Carrier loaded to the full with a fleet of six colourful wooden race cars waiting to be delivered to the race track, you can drop the upper level to let the cars drive on, then lift smoothly upwards when it's time to roll out. 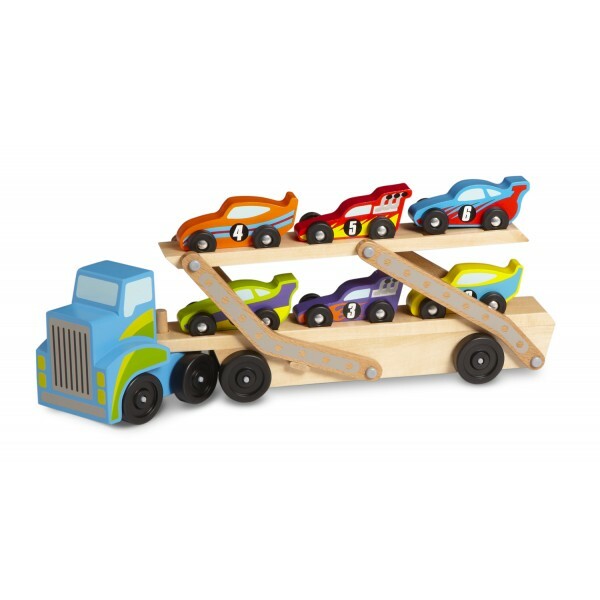 Sturdily designed, oozing style and stature and very easy to use, it's a racing car and lorry set in one that your little trucker is going to adore! This a great toy for imaginative play and narrative thinking - children can role play the cars' journey to the track on the carrier, and then get creative with the race itself, once the cars are safely unloaded. The double decker trailer converts easily for super smooth loading and unloading. Each of the cars are numbered and in a different colour, helping to develop counting and colour recognition. Over 2.5 feet when extended.